Summary: An evocative and stirring novel about a young woman living in the fascinating and rarely portrayed community of Yemenite Jews of the mid-twentieth century, from the acclaimed author of The Family Orchard. My reason for reading HENNA HOUSE by Nomi Eve is a little out-of-the-ordinary for me. While I do love the gorgeous cover and the book's description, I admit that this book wasn't really on my radar until my husband asked me about it. That's right -- my husband who doesn't read novels (or many books for that matter.) He was on Facebook looking at Penn State stuff and asked me about HENNA HOUSE. I almost fell over! He explained that this novel was written by a Penn Stater and I had to read it! He even went so far as to contact Ms. Eve! I was actually very glad he brought HENNA HOUSE and Nomi Eve to my attention. This novel was an intriguing story about Adela, a young Jewish girl living in Yemen during the 1920s. In many ways, it was a coming-of-age story for Adela (and you know how I love those! ); however, it was also a rich story about family, traditions, and survival. HENNA HOUSE begins in 1920 when Adela Damari is a young girl. The Orphan's Decree has recently been passed allowing orphaned Jewish girls who were unbetrothed to be adopted by the local Muslim community. Adela had pretty bad luck when it came to finding spouses, and the health of her parents wasn't exactly optimal either. As a result, things weren't looking good for poor little Adela until her mother tricks her cousin Asaf into an engagement with her. The two have a sweet childhood romance until Adela's uncle leaves with her cousin. A few years later, Adela's life is turned upside down when a different uncle moves to her town bringing with him his wife Rahel, who is both a dealer and a henna artist, and their daughters. Adela becomes very close to Rahel and her cousin Hani. Adela becomes inthralled with her aunt and cousin who teach her how to read and do henna drawings and finds some semblance of happiness in her otherwise pretty bleak life. And then.... drought and illness hit Adela's town. When Adela is 15, she moves to Aden with Hani's family and eventually discovers her long lost cousin Asaf. At this point in her life, Adela is forced to quickly grow up as World War I threatens to erupt, and she finds that she has many difficult decisions to face concerning love and family. I really enjoyed HENNA HOUSE for a number of reasons -- from the history aspects of the story, to the intriguing characters, to the cultural traditions. The story was beautifully written and I especially loved the focus on women and family. Despite taking place in an entirely different time, this book reminded me of THE RED TENT with the religious and Jewish culture references as well as the way female relationships were portrayed. I probably shouldn't say this for fear of sounding ignorant, but I knew very little about the Yemen Jews and what occurred in the 1920s. Reading HENNA HOUSE was definitely an eye-opener for me. I wasn't familiar with the Orphan's Decree and the entire concept of a Jewish child being pulled from her family to live with a Muslim family is just appalling. I thought the author did a fabulous job of creating the sense of desperation that Adela and her family had concerning this threat. In addition I appreciated so many of the characters in this story... especially the female ones. Of course, Adela was a special girl and I loved her voice as the storyteller in this novel; however, I also loved her aunt Rahel. What made this book so special to me was the interactions between the various women in the story. Adela and her mother had a strained relationship which was perfectly juxtaposed by Adela's relationship with her aunt. In addition, it was interesting to see how Adela and Hani's relationship evolved throughout the course of the story. And finally, I really enjoyed learning about the unique Jewish traditions in this novel. I honestly had no idea the Yemen Jews had henna as part of their traditions, and I found the parts of this novel featuring the henna drawing to be absolutely fascinating. In addition, I loved the aspects of the story which dealt with Rahel and her interest in healing. It was apparent that Ms. Eve did a huge amount of research to get her facts straight. HENNA HOUSE would make an excellent book club selection. There is a reading guide with twelve discussion questions and some ideas to enhance to enhance the meeting. I've probably already mentioned many of the discussion topics, but you might want to talk about family, customs, religion, faith, persecution, survival, love, friendship, female relationships, marriage, betrayal, forgiveness, and redemption. 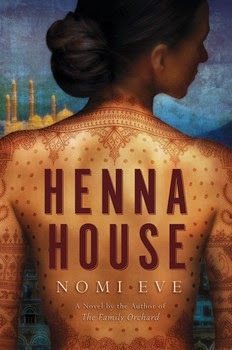 I enjoyed HENNA HOUSE and I highly recommend it to fans of historical fiction. I love the way you discovered this book! I know nothing about that part of the world in the 1920s so would learn a lot if I read this book. That does sounds interesting. I know little about Henna House as well.